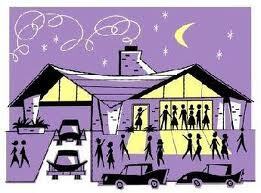 Houses & Homes VA: A Party that Friends and Family Will Never Forget! A Party that Friends and Family Will Never Forget! I love when friends and family get together, don’t you? But I must admit that some occasions are better than others. Here are some great ideas to make sure that your next social event is one that everyone will remember, in a good way! Nobody likes bugs in their food but if you are serving salad outdoors you can be sure there’s going to be a problem. Here’s a great way to keep the veggies and salads fresh and bug free. As part of the preparation why not “pre-package” the salads in those cute little masons jars? You know - the ones with that orange colored lid that snaps closed? A nice colorful salad looks great in those containers and it will stay fresh longer too. How many times have you had 10 or 12 people over and 35 dirty glasses when the party was over? Not to mention all of the half empty drinks that get wasted in the confusion. Why not use washi tape and put each person’s name on their own glass? This will save money and confusion and it actually looks kinda’ cute! If you’re serving ice cream it’s a lot quicker if you use a heavy duty sharp knife to actually cut it into the desired serving size. I was at a party once where the birthday girl’s name was spelled out on the serving platter! It doesn’t need to be that intricate but you get the idea. It’s also a lot quicker and easier than using the usual ice cream scoop. If you are entertaining at a cook out or outdoor event why not supply your guests with those cute little bottles of sun screen lotion or even mosquito repellant? How about some of those personal sized hand sanitizers? You could place them in an attractive wicker basket or the like and even make a cute sign that says “Sunscreen Station” or whatever you like. Believe me your guests will really appreciate the thought. Everybody loves watermelon! Why not make it convenient for your guests? You can cut the watermelon into shapes such as triangles or any design that you wish and insert those wooden ice cream sticks! I once saw someone use plastic cookie molds to create different shapes. A nice serving tray would help and no more sticky fingers! If swimming is part of the fun you could use a floating raft or pool chair to hold the various refreshments, soda, beer, whatever. If it’s nighttime a few of those floating candles are always a nice touch as well. This is one of my favorites! Fill some small different colored balloons with water and freeze them. Now you have multicolored ice to keep the refreshments cold. Lots of fun for the kids later too when they melt - balloon fight anyone? I don’t know about you but to me the tastiest of food loses its appeal if it’s sitting on a beat up folding table. Even a cheap plastic tablecloth makes a world of difference and for just a few cents more you could add a bit of ruffle or streamers around the edge to give it that festive look! You already know that when the parties over you are the one that has to deal with all the mess. Make it easy on yourself. Make sure to place a few of those large trash cans around the yard lined with the heavy duty trash bags (bottles are heavy). If you are into recycling you can label them accordingly and if you want something a bit nicer you can replace the trashcans with large wicker baskets. Either way you will greatly reduce the amount of time you spends tidying up after the fun is over. To Waste or not to Waste, that is the Question! What’s the biggest mistake you can make when planning a big night with friends and family? Running out of food! Nothing can turn a get together into a nightmare quicker than realizing the beer is gone or you’ve run out of those ever essential peanut pretzels! Here is a chart that should help you the next time you plan that special event.